The weight of a pickup truck matters in few places. Chandler, Arizona, just happens to be one of them. It’s barely 10 a.m. in Chandler, one of the dozen or so small cities that orbit Phoenix, and the temperature on this July morning is already inching toward 100 degrees. Mike Brewster, like the rest of his 300-pound cohorts yanking and pushing a couple of tons across the scorching asphalt, has sweat pouring down his face. “I’m telling you,” says Brewster, who happens to be the center for the Jacksonville Jaguars, “the white one is heavier.” The white one is a Sierra Denali with some custom grille work that Buccaneers guard Patrick Omameh is pushing through a parking lot. Omameh will spend training camp fighting to be one of the Buccaneers’ starting guards, and of everyone here, he would require the least amount of CGI to play the Hulk. Bobby Massie, the Cardinals’ right tackle, who’s spent his morning pulling the maroon F150, isn’t convinced. As Omameh finishes, Brewster calls him over. “Pat, which one is heavier?” A hand on his hip, still catching his breath, Omameh points to the Denali. “I told you,” says Brewster. Shawn Lauvao’s turn on the truck is over, and he’s off stealing some shade under what seems like the only tree for miles. The former Browns guard has been working with Bentley since the beginning, when O-Line Performance consisted of just a handful of guys in a tiny gym back in Cleveland. Since then, it has grown into a recurring roster of more than 30 NFL players. As Lauvao sits on the curb, a black BMW 650i pulls into the parking spot next to him, and all 6-foot-7 of Max Starks climbs out. After 10 years in the league, Starks is looking for a job; he’s hoping Bentley can help him get it. Almost every walk of NFL life is represented among Bentley’s 35. There are undrafted rookies looking for jobs, young starters still building toward their first free-agent deal, and players like Lauvao, who signed a four-year, $17 million contract to be a starting guard in Washington this season. What most of them have in common is that whatever type of player they were before they got to Bentley bears little resemblance to who they are after he’s done with them. No signs mark the entrance to the facility. During business hours, the front door remains locked while clients park around back. The entryway is reserved for visitors, which is why it houses nearly all the relics from Bentley’s playing career. His players know who he was. On a small table just outside his office door sits a commemorative white helmet from the 2005 Pro Bowl and, above that, Bentley’s jersey from the same game, with his no. 65 and the Saints logo on both shoulders. In four seasons with New Orleans, from 2002 to 2005, Bentley went to the Pro Bowl two times, at two different positions. He’d been drafted in the second round out of Ohio State after winning the Rimington Trophy as the nation’s best center. He played two seasons at guard before moving back to the position in the NFL; he was the best there, too. At the end of his fourth year, the Cleveland Browns handed Bentley a $36 million contract, with $12.5 million in guarantees. No center had ever been given more. At 26, he was the class of the NFL at his position, back in his hometown. “I can die happy now,” he said at the time. “This has been my dream.” He would never play another snap. During training camp in his first season in Cleveland, Bentley tore the patellar tendon in his left knee, a horrific injury. The scar runs about six gleaming inches, through the middle of his kneecap. What ended Bentley’s career, though, was the rehab. As he fought his way back, he contracted a staph infection that required two more surgeries as doctors tried to fight the infection. It had gotten so bad that doctors considered amputating his leg — many doubted whether he would ever play again. It took Bentley two years to regain the physical ability to play, but by then, the will to do so was gone. He would eventually sue the Browns, who suggested he rehab the initial injury at their facility without telling him other players had contracted staph there. They settled in 2012. His relationships in Cleveland had frayed long before that, though. The climb back to health was accomplished mostly alone. The injury was so severe that the typical prescription of ice and muscle stim wasn’t enough. “Having my career end the way that it did, and not going out in the blaze of glory every player would like to, it built up a passion, in terms of performance,” Bentley says. He decided to steep himself in the formal education of that performance. He became a certified strength coach, a certified sports nutritionist. The end of one career created the beginning of another. The location in Chandler opened in June. Before that, Bentley shared a gym with another trainer in Scottsdale. Some of his players think the move was about more space for a growing business. But his reasons are simpler. The new place is about 10 minutes from home in nearby Gilbert. Bentley’s office is mostly empty. A dropped photo of an American flag sits on the floor behind his desk, cracked glass removed from the frame. A photo of his family and a stack of business cards flank an empty pen organizer. On each of the far walls hangs a photo. One is a shot of Cleveland from Lake Erie — a reminder of where he, and this, all started. The plan was to create a client base from the high schools of northeast Ohio. He drew up an initial list and called coaches from the area. His name was often enough to earn a meeting. He scheduled several a day, typically starting about 9 a.m., with an hour plotted out for each. They rarely lasted that long. With brochures — and hat — in hand, the former Pro Bowler was often cut off before he could finish his pitch. See, we do everything here, they’d say. Rejected, Bentley would walk back to his burgundy Ford Expedition and drive around to fill the hour before his next sit-down. After a few months spent “coaching” groups of children — “It was like Romper Room” — Bentley got a call from Steve Hamilton, the head coach at nearby Elyria High School. He had a project for him, if Bentley was interested. Isaiah Byler had just finished his junior season; he was 6-foot-5, nearly 340 pounds. Hamilton thought that if Byler could shed some of the weight, there was a chance, however small, that he might be able to play lower-level Division I football. “Pro Bowl offensive lineman, the highest-paid center in the history of the NFL,” Bentley says, “and here I am in the gym with a kid who wasn’t even a varsity starter, and I’m treating him as if he’s Larry Allen.” In nine months, through a combination of fitness training, drill work, and a complete change in diet, Byler lost 70 pounds. At Ohio State’s football camp the following spring, Bowling Green offered him a scholarship. At season’s end, he was named first-team All-State. The other photo, not a few feet from the image of the Cleveland waterfront, is of the Golden Gate Bridge. “If Cleveland’s where we started,” Bentley says, “then San Francisco is what’s next.” By the start of 2010, Bentley had finally built a functioning business, thanks mostly to a steady influx of high school players. And that’s about when Alex Boone walked through the door. Everyone who knows football in Ohio knew Alex Boone. An All-American at St. Edward, he was a starter as a freshman at Ohio State. But his career in Columbus flatlined from there, a mix of apathy and heavy drinking keeping him from ever becoming more. He was arrested just days before the NFL combine, and the draft came and went without a call. San Francisco scooped him up as a free agent, and he spent his rookie year on the practice squad. Boone had heard about Bentley and his facility, just down the road from where he grew up in Lakewood, and after that first season, he reached out. “We had our first come-to-Jesus meeting,” Bentley says. “I said, ‘Here’s the deal: I love what I’m doing, I’m having fun with it, but I don’t want you to waste my time.’” When Boone assured him that he was committed, Bentley assured Boone that with the right plan, and time, he could turn him into a starting NFL lineman. That took two years. 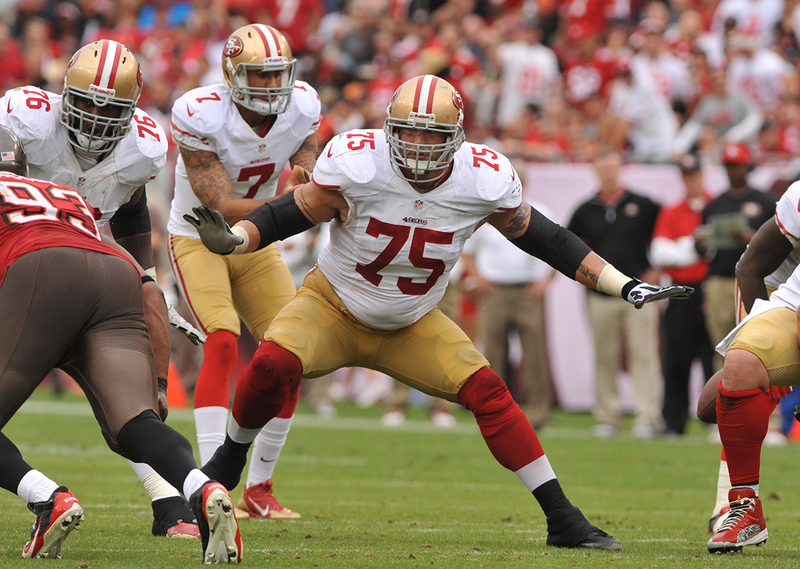 It took three to turn Alex Boone into one of the best guards in football. Dozens of power outlets line the walls inside the gym. Before it was Bentley’s, the unit belonged to a golf cart rental company. Above a dense cluster of plug-ins is a banner with two quotes. One is from Phil Knight, the other Henry Ford. The logo that made each famous is stamped next to his name. The product, as evidenced by the ubiquitous initials, is him, and Bentley does his work in selling it. He’s extremely active on Instagram, where he posts video after video of what his players are working on. He’s a showman, and a loud one. “He’s opinionated in his beliefs, and he approaches this the same way he did as a player,” says Giants guard Geoff Schwartz. In the months after retiring, Bentley did a stint on sports talk radio in Cleveland, before resigning because his producer wasn’t making enough money. What players are paying for here is what LeCharles Bentley has been for a while: someone not afraid to challenge what they think they know. Shawn Lauvao, Bentley’s next NFL client, was in his second year as a guard for the Browns when he decided to give O-Line Performance a chance, on an idle Tuesday during the season. Within the first minute, Bentley had pointed out a fault in his stance — the same one he’d been using on his way to being a third-round pick and NFL starter. Max Starks had been in the league about five times as long when he came to Bentley a year and a half ago. “We get so used to the old training mantra: squats, bench press, all the traditional static lifts,” Starks says. “But actually doing it functionally and movement-related is something totally different. You think it’s easy, but because you’re so ingrained in the old way, it’s almost like you’re an outsider looking in.” Starks was actually working with the trainer that split his gym with Bentley in Scottsdale; his program, like so many, wasn’t tailored to a specific position. Starks says he appreciates Bentley’s commitment to learning new approaches to areas like kinesiology and biomechanics, but like every other player who works with Bentley, the draw was in applying those qualities in lineman-specific ways: squatting at an angle, lunging with weights at set distances, moving at the height and in the direction they move on the field. It may sound like Bentley is trashing traditional NFL coaching, but he promises that’s not his intention. He has a dialogue with many of them. “I have really good relationships with the ones I have really good relationships with,” Bentley says. “There are a couple that don’t like what I do. I know that.” Bentley has gotten offers to coach at the college level, but his reservations stem from the reasons he sees value in what he does. Parked out back, in the small lot just outside the garage’s massive door, is a food truck: Sandra Dee’s Certified Creole. She’ll be parked there all day, serving three square meals for whoever wants them. Breakfast is a build-your-own omelette with four generous slices of applewood-smoked bacon. Lunch is two eight-ounce chicken breasts, complete with a spicy red sauce and vegetables. Dinner is similar, only with two 10-ounce hunks of steak replacing the chicken. Bentley curates every part of the menu, down to the hot sauce. Between breakfast and lunch, when Sandra Dee was wondering if she should scale back the spice, she brought a taste to LB. He found what he was looking for with Bentley. “Guys have to buy in the whole way,” Schwartz says. “I’ve trained at API,1 other places, where if you don’t want to come that day, you don’t have to come that day. They’ll take your money. They’re OK with it. If you show up, they’ll train you hard. [Bentley] doesn’t accept that.” Transitioning to Bentley’s program meant fundamental lifestyle changes, especially with his diet. Bentley’s prescription was a life free of all carbs and sugars. Schwartz’s beloved fried rice was no more, replaced with fatty proteins like Italian meats and sausages that would help with his recovery time but also provide energy. “I just looked in the mirror,” Schwartz says of where he saw the change. 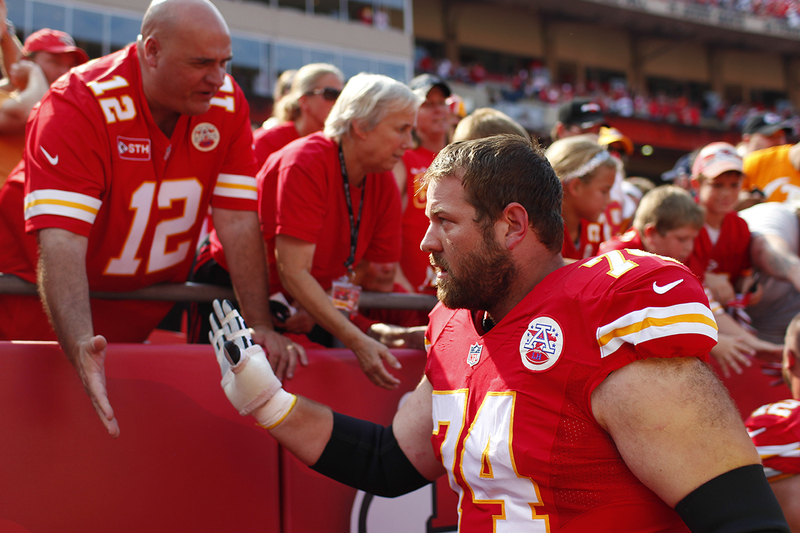 Having just signed a one-year deal with the Chiefs, Schwartz arrived to training camp at 335 pounds, but rather than shedding some of the extra weight as he typically did at the start of the season, he kept it on throughout. By the early part of the season, Schwartz was a starter, and in March, the Giants made him their left guard and handed him a four-year contract worth nearly $17 million. On either side of the gym, there are oversize photos of players who have come through the program. The group of five on one side is Bentley’s original group: Lauvao, Boone, Brewster, Massie, and Bears backup lineman Taylor Boggs, who found Bentley’s name online and cold-called him before his senior season at Division II Humboldt State. 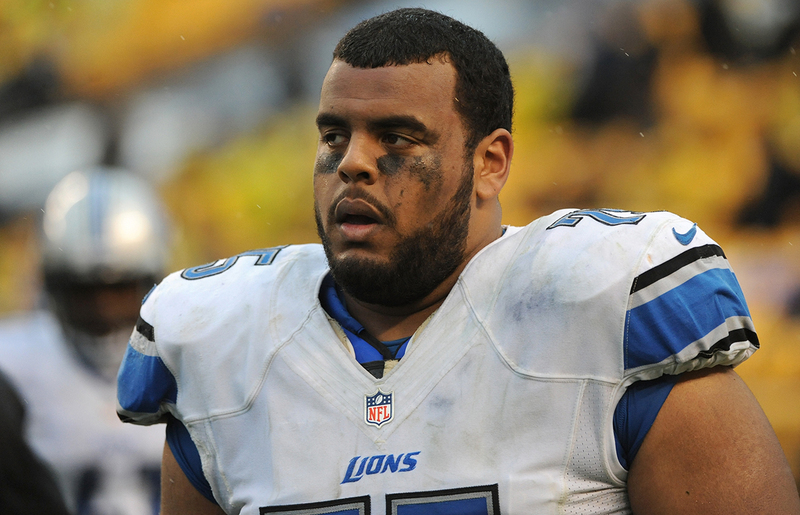 The other two photos represent Bentley’s new class, the prize of which is Lions guard Larry Warford. When anyone is asked about Bentley’s methods, to a man everyone mentions what Warford did in his rookie season in Detroit. Warford believed him. He traveled to Scottsdale to train for the combine and was drafted in the third round. Warford was a starter at the start of the Lions’ season, and in his first year he was better than Warmack. Warford was, by many accounts, the best rookie in football; he even got a vote for Offensive Rookie of the Year, a rarity for an offensive lineman. What happened over the next few weeks, Warmack says, is that Bentley took the time to peel back the layers of who he was as a player. 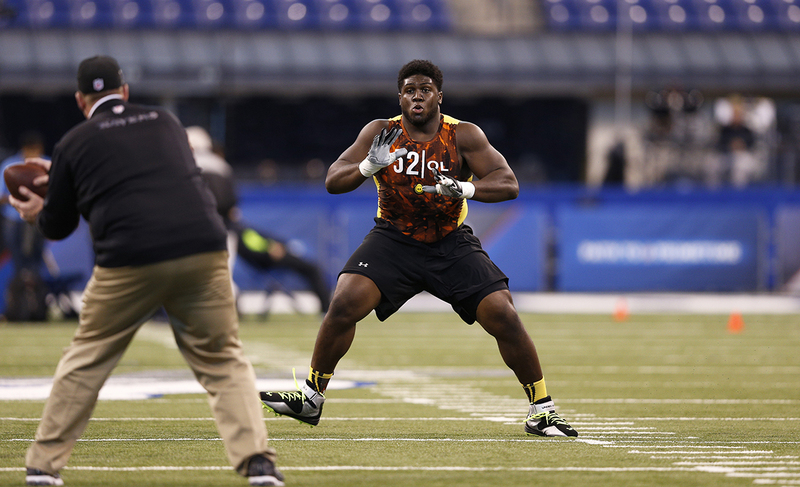 “It’s about finding the secrets about yourself and unlocking those secrets,” Warmack says. “Not a lot of people know how to do that, especially at our position.” The secret Warmack couldn’t uncover during his up-and-down rookie season was how to synthesize the information coming from so many different directions. At Alabama, he had one job, passed to him by the offensive line coach. “You want to do the right thing for your coach, but at the end of the day, you have to make the play,” Warmack says. “I feel LB puts us in a position where you can follow base rules to be successful. I listen to what my coach tells me, but if I’m in a situation where that doesn’t work, I can always follow these base rules I’ve learned from working out with him, and it’ll work out. On two of the chairs of the facility’s main entryway, Willie Colon and Khaled Holmes are contemplating the existence of Bigfoot. They’re both getting their post-workout IVs, and the TV is tuned to a show about ghost hunters; no one knows where the remote is. Colon, a starting guard for the Jets, is 31; he turned to Bentley after an injury a couple of years ago. Holmes is 24, in his second year with the Colts, and penciled in to be their center. This is Bentley’s business these days — NFL starters everywhere you look, all at different points in their careers. There are some exceptions, like Boggs and Starks, who would sign with the Cardinals about a month later. Starks says he wouldn’t still be playing if it weren’t for Bentley; he’s down to 330 after playing most of his career at 350 or more. Warford is the clearest blueprint for what Bentley can do — take a mid-round prospect and turn him into a Pro Bowl–caliber player in just a single season — but there’s a reason his photo is next to Warmack’s in the gym. Coaxing a top-10 pick from last season to the gym is a coup. That’s not where it ends, though. For years, Bentley was rebuffed when he reached out to the best offensive line talent in the league. Asked who he still wants to work with, Bentley says he just got him: Trent Williams, Washington’s left tackle and one of the elite offensive linemen in football, had made his first trip to the facility a few weeks earlier. This is Bentley’s next challenge; he can make a backup a starter and a starter a Pro Bowler. Now, he gets to find out what he can do with the best. At this point, Starks, Lauvao, Brewster, and Massie have joined Holmes and Colon in the entryway. Their group is done. The one that includes Warford and Warmack should be here soon. The future of offensive line play is on its way. The future of offensive line play is here. A popular chain of performance centers, now known as EXOS.